Catering Services: A total of 6 items at only $8 per pax. Too good a deal for a bigger crowd. So, click for menu, click for choices, click to check it out yourself!................................... .. Catering Services: Do you have a larger group of people and still want a good spread of food to serve around. You get a total of 8 items with only $10/pax. (Use the coupon as above to waive off the tr.. 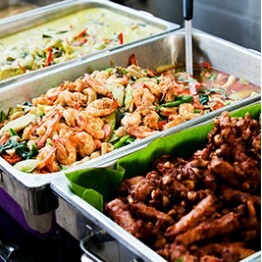 Catering Services: This standard package of buffet suits families and corporate events the best. With a wide spread of 10 items with a full range of products from you to chosoe from, you can fit to an.. Smaller group but same variety of 10 items! here we go! Catering Services: Smaller groups but yet you want to serve a spread for them? Click here for the range of delicious food choices!​ Order Below : Order in multiples of 5pax. 10 items. .. Catering Service: Ditch take aways and order a full buffet with the full set-up for your cosy event! Who says 10 people cant have a full buffet? We say yes!​ So what say you?.......................Cli..